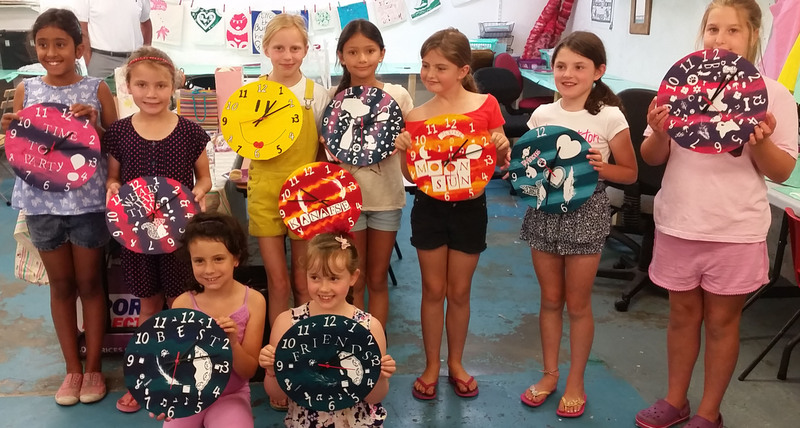 The duration of the party is roughly 3 hours during which time you will design your own clock face, print it onto fabric before constructing the final clock. This is a fun and involved activity lead by an experienced tutor. Simply email us at lydia@irisanddora.gg or telephone us 01481 721375 with your preferred date. We can do after-school parties or weekends and school holidays (although these get booked up fast) We ask for a minimum of 8 persons on weekends and during school holidays and a minimum of 6 for after-school parties. Remember to tell your guests to wear old clothes as the inks we use are permanent. We ask for a £30 deposit in advance.